1st Day: Get morning/day flight from Bangalore (BLR) to New Delhi (DEL), after arrival Delhi transfer to Shimla via Volvo bus about 370 kms. 8th Day: In the moring arrival at Delhi and transfer to Delhi IGI Airport (DEL) /Railway Junction (DLI) for your onward journey to Bangalore. There is no direct Trains or Airways connectivity between Bangalore and Shimla Manali, but Kullu is well connected by air and road from Delhi. There is another good option, first travel Bangalore to Ambala Cantt or Chandigarh by Express Indian train via New Delhi. From there you can take State Transport Volvo bus for Manali or hire Car. Here are three best ways to reach Bangalore to Manali, Himachal Pradesh via National Highway by AC/Non-AC Indica Car or Volvo bus. via NH 7 (This route has tolls) : The driving distance between Bangalore to Manali by this route is approx 2,674 km, and travel time from this road route is 41 h with traffic and 38 h without traffic. via National Highway 79 (This route has tolls) : The driving distance between Bangalore to Manali by this route is approx 2,816 km, and travel time from this road route is 44 h with traffic and 40 h without traffic. via 8 (This route has tolls) : The driving distance from Bangalore to Manali, Himachal Pradesh by this route is approx 2,921 km, and travel time from this road route is 45 h with traffic and 40 h without traffic. himla, Manali is the ultimate hot summer retreat destinations in Himachal Pradesh. The Valley of Gods, Shimla Kullu Manali shower the tourists with its enigmatic view of the snow capped mountains of the Himalayas East-North range. Along with an excellent honeymoon destination for the newlywed couples, it is resplendent with a variety of tourist sights, and snow activities like skiing, Paragliding, trekking, river-rafting and mountaineering for the adventure enthusiasts. Here, we offer the Best Shimla Manali Package from Bangalore, which are available in all categories (budget to luxury). So, one can choose their own package according to budget, and fully enjoy a memorable honeymoon trip in this earth heaven. By choosing any of package, you can enjoy your honeymoon to the core with your lover and dear ones. Most of packages will lead you on a journey at some of the renowned access points in and around the Shimla and Kullu Manali. Do you want to escape from the oppressive heat summertime and head somewhere cool? Dig your way through Shimla, Manali, the “Paradise of India” to experience mesmerizing honeymoon. This natural paradise is one of the most wanted places in India that traps thousands of newly wed couples every year. Shimla and Kullu Manali are exquisite layout places of natural beauty and its wonderful cool climate adds extra convenience for honeymoon travel. 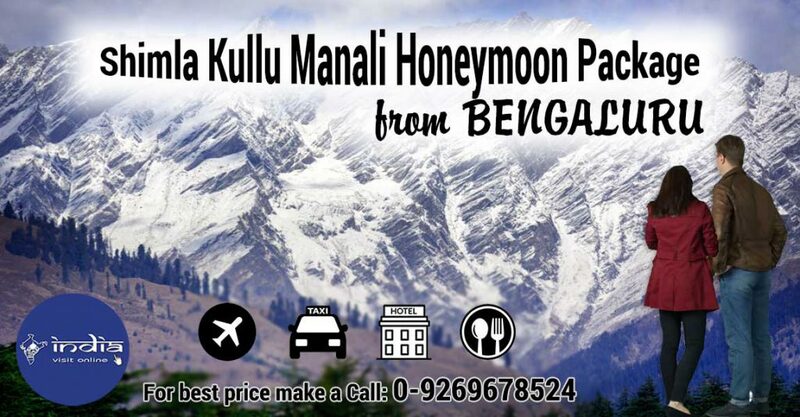 Manali Honeymoon Packages from Bangalore might be as great as it has typically been in your dream honeymoon destinations. We are in Delhi offering himachal tour package as well as various most popular honeymoon tour package online at very affordable and discounted prices. You will be glad to knowing that Himachal tourism is worldwide known by its snow-covered hills which provide marvelous opportunity to enjoying the honeymoon in Himachal in a delightful and memorable way. Thus, come and explore the attractions of Kullu Manali that has an inimitable charm and beauty that lures honeymoon tourists not only from India but from all over the world.